My guess is that few of us like being told what to do—especially if we don’t think the person has our best interests at heart. Yet we have different ways of showing (or not showing) our true feelings. Jesus spoke to such differences. He tells the story of two brothers who were told by their father to spend the day working in the family vineyard. One son said he wouldn’t do it— but later changed his mind and went. The other son agreed to do the work, but didn’t do it (Matt 21:28-32). Jesus told his parable to religious leaders who had challenged his authority to chase money-changers out of the temple while he was, at the same time, showing mercy to the tax collectors and prostitutes that came to him for help (Matt 21:12-13) (Matt 21:23-27). Looking back, Jesus was in the process of being the faithful Son who had come to work in his Father’s vineyard. But he was like no other son, and this was not just any vineyard (Isa 5:7). Jesus was the true vine of Israel. He was the Temple of God, mirroring the heart of his father in heaven—for some of the most unlikely people. He had come to forgive and to befriend those that a religion of laws had condemned. Seems to me that Jesus also came to help people with authority issues—see what real authority looks like. Admittedly Mart I had to do some textual research on the Scripture verse you offered up as referencing “Authority Issues”. The parable about the two sons in Matthew 21:28-32 can be seen as simply the difference between saying and doing. Followed by reference to religious leaders and religious outcasts who follow or don’t John’s call to repentance. It is the following “parable of the tenants” in Matthew 21:33-46 that shows the difference between Jesus the True Son and the failure of Israel’s leaders to do the will of God and show the heart of God. If you are trying to show that some of us have problems with authority, I would guess that, that particular attitude is across the board found in those who are repentant sinners and those who only think they are as well regardless of their station in life. Both seeing God as the ultimate authority and not man. It seems to me, that we having the human receptive/rebellious element of choice within our DNA and our God-given ability to freely choose, causes us to be on one side or the other, with authority. We are constantly challenged according to whether we align with, or have the power/authority over something, or other circumstances, or people have it over us. Even to the extremes of Abstinence verses Addiction. One side is showing complete power/authority over the flesh, and the other complete lack of power/authority over a situation or substance that is seemingly opposing, or trying to control us. Were are happy to see those speeders pulled over getting their due, until it is us in the driver’s seat, then our perspective and our actions, as facing the mirror, either bring out the best of worst in us. My case in point is this, there are places in our selves, our society, and our world, where mirrors are either grossly ignored, purposely embellished, or intentionally broken by those who do not like what they see, or actually reflect, or hold captive. Christ also taught a lesson about those who were nothing but white washed tombs on the outside, but dead or totally dark on the inside. It seems to me when this human life appears meaningless and tiresome, Jesus, is here to show us just what a gift it is — and what His authority can make of us, even out of our rebellion and self-determined foolishness. Our acknowledgement of authority varies in different ways. Most people in the world do not recognize God’s authority over them, but some do. But even among those who do, there are differences. I recognize God’s authority over me, yet I still tend to decide for myself if I want to do what He tells me. This is contradictory. I ‘know’ God has my “best interests at heart,” but how much do I really *know* this? It comes down to the difference between knowing the doctrine and living by faith …of which I’ve made progress, but still have a long way to go. It seems that Jesus confronted those with authority issues like the religious leaders because they wanted people to think they were the highest authority on God when they did not even have a clue about needing God or who He is. They did not recognize God as He stood in their midst in the person of Jesus Christ. They seemed to desire to be the final authority by wanting the places of honor rather than directing people to One who holds the highest place of honor. Proverbs 3:5-8 Resting in God’s authority brings healing and direction. Matt. 21:43 the Kingdom of God was taken away from the Jewish leaders and given to the disciples who would produce the fruit of the Kingdom, not the burdens of it. Fruit equals love joy peace patience kindness gentleness self-control. There is no authority above this. Unquestionably Jesus of Nazareth is our ultimate authority figure and His words and actions show us how an authority is to treat those under their responsibility. Whereas everyone agrees that Jesus came to heal the sick in regards to those operating outside the “law”, doesn’t it sound just as reasonable that those who consider themselves to be operating within the law, but miss the intent of the law are just as sick and in need healing? Maybe more so. Aren’t the blind leaders of the blind also blind? What else but the touch of the Holy Spirit can open the heart of one whose heart is hardened by a misguided loyalty to God? Is this the unforgivable sin spoken of, that a person who holds on to the law as instructed to by God is then punished for not letting it go, because they fail to see the intent of the law and are stuck on the letter of the law? Not answering the urging of the Holy Spirit until they no longer are able to hear Him? I guess my question is, given that all authority in Heaven and Earth is given to Jesus, what can possibly prevent Him from doing as He wills? His will and intent being the salvation of all of mankind’s sinners. NO more posts after the afternoon thoughts of Steve? Was there anything wrong with the website? I pray that all my authority issues will be healed, that I may totally trust my God, that His Authority is sure, and trust worthy, never will He be misleading me. He is the One who is not only The Authority, He is also the One who was willing to die for me, in order to save me from my sins. I did have great authority issues, especially those in authority in the church I was in, the paying of tithes was the law, and all the tithe went to the central place, so lots of money came in. The local people lived in poverty, as the tithes was 10%, and then the second tithes, and then the third year another 10% for the poor. So much money, and the ones in the central place had big salaries, and big houses,and a great campusses were built, with extravagant buildings. See my problem, as long as we would pay our tithes the authority in the church was willing to lead us. (That’s what I ; respect so much in Mart de Haan’s ministry, they do not ask for anything, great thing, thumbs up! Where was that principle of Christ, that the ones who were leading were the ones serving? That was my question 20 years ago when I left that church. Is the one leading the church willing to die for his sheep? Jesus was willing to die for His sheep. He is the One in authority. so I should look to the leading of Jesus, more then anything, and not look to any man. Jesus is the One in Authority, He is the One who knows all things, He is all knowing. I know nothing, and the only thing I can do, is worshipping Him. Like the Israelites marched around Jericho in 7 days, praising God, and singing glory to Him. And lo and behold, it was God who acted, and the walls fell. That we as christians soooo trust God, and worship Him, together in praise, and see what would happen in the world! Off topic, but yesterday we had a Feast day, 70 years after the liberation of the Nazis. Days and days we have had seen programs on the war, and of the freedom. Our city was freed by the polish, the neighbouring city was liberated by the Canadians. There are still many Polish here since then, as they could not go back to Poland, since it was occupied by the communists of Russia. There was one story of a man who was a boy of 9, the Canadians came to the river where he lived with his parents, gunfire all around, they fled the house, and he said, all was well, till he turned around and looked back: He was petrified, when he saw the house burning, and he could not walk anymore. His father had to pick him up and carry him. I had to think about Lot’s wife, who looked back, and was petrified too. We ought to obey what the Holy Spirit tells us, He does not say anything to harm us, but to protect us. with God all things are possible? I struggle with authority issues, for in the past I put my faith in men, who claiming God was on their side, were doing His will but in time I found it was not so. I no longer trust in my own judgement when it comes to following authority here and now, as corruption unfolding shows that men in authority can still be corrupt! In my Country at present men who had received Honours from the Queen are now having them withdrawn because of abuse they carried out when in positions of trust. I am left wondering who to trust on earth as I would have thought that if they received these honours in the first place then they were approved by God! If I can not trust the authorities who awarded the Honours when I was brought up to believe that these authorities were God’s authority then who on earth has authority that I can trust! Trusting in God surely means trusting in those in high places as being appointed by God as I have no authority over them, it is them who has authority over me so whom do I trust when I no longer can trust their decisions to be ordained by God? To whom on earth God can I go! There is no one here who has not felt both the blessing and the pain that comes from the proper use and respect for authority. Most of us first encounter this element of authority through being born to parents who have god-given authority over us. If authority given by God, is also held to a godly standard, then it by its nature avoids misuse and all its abusive results. When power/authority is driven strictly by the desires flesh as the standard, ignoring the intent and will of God, then the flesh alone rules, and the elements of its nature take precedent. In animal world that natural precedent is the “Survival of the Most Fit,” the larger, the more powerful, and the most well equipped for the fight that usually dominates, all designed by God in His balance of nature. In the human realm however, we clearly see things daily that do not represent this same order of things as designed by God, where the godly standard seems to have gone completely astray, and the desires of the flesh, if you will, have tainted God’s original design and standards. We live in a world of humanities mistrust, deception, and darkness, where many clearly have no Fear of God, no respect for His Word, and do not know where the boundaries that God has placed before us, begin or end, so we design our own. Who is at fault in this misguided world we live in today? Isn’t it all really driven by our flesh and its misguided and rebellious way “we will,” to exercise our Authority Issues. foreverblessed… the church today has no problem with the tithe issue, or I should say, 90+ % of the church going people today have no problem with it, they just plainly ignore it. So, the blessings that could come from observing in the following of the premise of the tithe, is never experienced as well. To me, the godly authority about tithing as being the godly standard that should be recognized and applied, virtually goes unmet in the church. We want the authority over all our money, not’s God’s Authority, but our own, just as a we will it. I for years followed the letter of the test about tithing, with one small addition, I also directed where I thought that money should go and be used. But, that is not following the Will of God, For all is His, to do as He directs. So, for all my years of designating my tithes as being, “For Missions,” which I wrote on the face of my checks and held in my heart, became an unrecognized authority issue with me personally directing. My responsibility to direct the tithe was changed in that moment, to just let it go willingly and not to encumber or direct or try to have any authority over God’s Authority. A wake up call about authority was issued to me, one which I could not ignore, and I no longer give any credence to worrying about my tithes given freely and with complete surrender. This prayer from a man in authority who recognizes where that authority came from. From William J. Johnson, George Washington, The Christian (New York: The Abingdon Press, 1919). So God got it right and Einstein too for we are all equally wise and equally foolish in God’s eyes. For there are times in my life when I am guided and there are times when I am misguided and likewise for those in authority they have been guided and misguided but time to God is not an issue for He has eternity to make all things right! He knows our hearts, He knows when our motives are selfish, when our hearts demand revenge and not justice, when we judge others but expect God not to judge us. It is not until I stand up and say in my heart of hearts that I have never been guilty of expecting more compassion from God for myself than I have for others whom I feel prejudice towards that I see myself as I am! It is then that I know that I am equal as the next person be he a beggar on the street or the Queen of England in needing God’s Grace! For I owe man nothing and man owes me nothing but it is God whom I owe my life, I am His. Satan gets into my head and tells me I am a disappointment to myself, others and God but God says I am His, I must say Yes God, I am yours, the battle is within me! Just a closer walk with thee! My Dad was a decorated soldier of the Canadian army for 26 years. He was part of that campaign in Holland. If he were alive and able, I know he would have returned for that ceremony that was held yesterday. He and Mom did make a trip back in the 80s to visit Holland. He left your country in such a shabbles after the war that he was anxious to see, firsthand, how things progressed for your country. He always spoke warmly of the Dutch people. He loved your country. “Seems to me that Jesus also came to help people with authority issues—see what real authority looks like”. Exactly why I always consult with Jesus when it comes to dealing with people. Don’t trust anyone and never will. If it weren’t for Jesus I’d have been dead loooong ago. He’s the reason for my being. Anyone else with trust issues? Of course, we all do for one reason or another. Jesus is the ONE we all can trust. when a person loves you and they have your best interest in mind and knows what that interest is, you can endure the hard and difficult stuff. especially when you know the same valley has to be walked through whether you obey or not. i guess you could call this reverse logic to temptation. faith and trust in the One who loves us in spite of ourselves will complete the work He has begone in us. feelings, most of the time, are based on our thinking not His Word and Spirit, a better sign post and path for life. I think more importantly is the thought am I someone others can trust, ya know like being trustworthy. Not paying that much attention to how trustworthy others are but just being that person one’s self. As others mentioned earlier anyone can abuse authority and many have. Being authoritarian is oppressive. It happens in marriages, parenting, governments, churches, religions, jobs and just in regular relationships. Pushing our own thoughts on others rather than promoting them to think for themselves. I did a word search on “authority” in the ESV and it seems we are given the authority to do good, seek what is in the best interest of others, cast out demons, etc.. That is what Jesus did and God had given Him ALL authority but it was never to push himself on others or to rule over them with an iron fist. It was forgiveness and mercy, we know Jesus had our best interest in mind with every single action he took. street, did not read what you had written before I commented but it seems we agree. Am I trustworthy? Of course not! Don’t trust me, trust the One I follow. I will fail anyone and everyone. It’s my fallen nature. Look up, don’t look at me. I’m only an unfinished work in progress. Again, it’s not about me, it’s about Jesus and all that He stands for in our lives. Having been let down by people in authority it is them that I least trust. I tend to look to people I know well from years ago that I have established relationships with. I look now at the person and not their beliefs for I find that a person’s actions speak louder than their words. I do not judge for I have found many non-believers actions to be more in line with Christ’s behaviour than many who claim to be Christian. What a man does is much more important than what a man says. Just as what a man does not say often says more about him than one who boasts. Life is a learning curve and the older I get the more I learn about myself and others. It is in everyday life that I have learned more about people than listening to what is on our televisions and in our papers. They tend to sensationalise so to attract viewers/readers and my son told me being the type of person I am I would be best not to watch them. My sons are a real blessing for they look out for me in a world that is changing faster than I can. I thank God for surrounding me with good trustworthy family and friends and have learned that they are what is important in life. I guess for me I have been one of those that my trust has to be earned, it is so precious that I just do not give it away before I know and experience someone. I used to be like that when I was much, much younger(trust first and ask questions later) so I had to learn the hard way and boy did I learn that lesson through some very tough lessons. Sadly it was no different being involved in the professing Christian community. Lot of wolves dressed in sheep’s clothing that are out to harm others. I do know however that as long as the Words of Jesus are being heard there is always hope for change accompanied by forgiveness and mercy. As an individual I find it hard to see how God is making a difference in a world where Science and Technology are the driving force and men in authority are more driven by money and power than faith and conscience. I do see Godly people at work but it is not at the realms of power in this world but in the everyday worker who endeavours to do an honest day’s work for an honest day’s living, pays their taxes and their bills, and tries to live an honest life. The more power and money a person has the more they seem to want, perhaps it is human nature and it is why I am satisfied being ordinary for it keeps me grounded in what is important in life. I can not see this world as any different today than in Jesus’s day and if Christianity were working I would expect it too. Instead we have abuse, robbery, murder, terrorists and in some ways it is worse than in Jesus’s day. I long for the better world to come but as I get older I see it as being less likely in my generation. Some of us have witnessed the worst man does to man depending on our positions in life. When you have seen this it is difficult to envisage man being any other way. The jobs we are in do affect our perspective though so others will see the world very differently. It is what God sees is what matters and He sees the bigger picture. I do not look to any man for answers but search my conscience as to what I believe God wants me to do in the circumstances I am in, this way if I fall then I know God understands and will give me other chances to put things right. Our Church produced their own Christmas cards to raise money a few years ago and this verse is on it. Baffled and bruised Lord, show me the way. Peace be still your Lord is near. Always so close to show you the way. Weak and dismayed Lord, show me the way. Walking with God is a double edged sword, embrace it. As you say, Vivien, a Jesus-follower should not be led astray by the wiles of somebody who wrongly seizes power. In my experience it doesn’t take long to discover who says one thing and does another — compared to the one who is willing to obey legitimate authority. Being all talk and no action destroys trust. Jesus’ authority is the real thing — “All authority in heaven and on earth” — because he entered his Father’s vineyard to do the greatest work in the universe. There is a real good series going on “Discover The Word” called “How to respond when people disappoint us”. I guess I have figured out that it is not my business whether anyone else is living under the authority of Christ but just whether I am or not. When I think about how often I fail in that area I am able to show more grace to others. In my reading this morning I see why David was called a man after God’s own heart. When the Lord was blessing him David realized that the blessings were because of who God is not about who David was. David asked, “‘Who am I’ that you have chosen me even knowing everything about me you still have showered your blessing on me?” David lived under God’s authority and living in that place understood how very much grace and mercy had been given to him. I believe that is what we have to do in this life put our trust in others and that is why life can go either way because some will let us down and some will not let us down. I have noticed that some are much more expert in discernment than others. I have heard my friend talk of people she would avoid at all costs while I would tend to go with an open mind and end up getting hurt in the process. The more people disappoint you then the more likely you avoid people but I have found also that the more you are disappointed then the more you trust God and not people. So God is leading me into a closer walk with Him. Hallelujah. I must remember that God can change something that I see as bad happening me and make something good from it! It is easy to forget that life is a journey and God is always in the driving seat when it comes to knowing what is best for me! i think discernment is a quality developed over time by knowing and understanding God’s Word and hearing His humble voice. Jesus prayed that we would not be taken out of the world, but that He would protect us. yes we get battered and bruised in life and we have to live in the wilderness, but His Word sustains, protects, and energies us. it purifies our life together with God to be Holy and Loving with Him and others. fireworks are guaranteed. Today is the National Day of Prayer. Let us join together to recommit our lives to the Lord’s Authority and pray for our countries that we depend on God to bring peace all around the world and to give wisdom to our leaders and to each of us individually. It has just been an exhausting couple weeks with doctor visits for both Matt and I, council meeting and meetings with Federal agencies and county commissioners. Being an authority figure myself places me in the thick of other authorities all the time. Before I begin our city council meeting though I always say a prayer. It is directed to God the Father in the name of Jesus the Christ, asking for the Holy Spirit to preside over our meeting and assuring that the actions we take the decisions we make are all in concert with His will. Like Viv and Joyce I am somewhat jaded and cautious of “agencies” with authority because life has taught me to be. Especially if said agencies will not surrender to the higher authority of God the Father through Jesus Christ the Lord. So I guess you can say I have an authority issue. However with relationship to the specifics of our religion in the light of our subject it seems to me that the entire Protestant movement had an “authority issue” with the Pope in Rome. Was the pope authorized by the Holy Spirit to be in the seat once occupied by Peter or not; I suppose that is the issue. Yes Pooh, Lord help both people and leaders to search our hearts and minds to do what is pleasing to God and God alone and put our differences and prejudices away so that we can unite in love and peace and make the world a better place for all. Amen. It certainly was here in Northern Ireland an issue that caused 30 years of a religious war that has taken its toil on many. We went to the polls today as it is election time here, and my son said to me, Mum, I am not voting because it is always the same here it is about religion. I said it was up to himself for I know he is right the outcome is always the same. Each side is so entrenched in the belief that the other is Satan himself. I am so tired of it all that I do not read papers or watch the news on television. If it were not for my faith I do not know how I could go on in a land where the love of many has gone so cold. Steve, do you mean the Peter in the NT? If that is who you are talking about the Pope and that Peter do not seem to have very much in common at all, well hopefully they both believe in Jesus. I do no think Peter would have ever wanted anyone to set him on a pedestal, kiss his feet or hands or treat him as people do the Pope. Peter pointed people to Christ not pointing people to him to go through to get to God but to go to God directly for themselves. The Pope is just a man, sadly that many worship I do not think Peter would have ever allowed that to happen. I was thinking that humans with authority issues get indignant when any one asks them questions compared to when anyone questioned Jesus or even asking questions of God neither seemed to get ruffled. I went to a Catholic church to ask a priest (I know I told this before) why did he allowed his parishioners to refer to him as father(Matt 23:9 NLT) when it clearly said in scripture not to do that and he said because it was just tradition that had been passed down and got a little miffed with me for asking. I will not go into the rest of what happened but it was not gentle or kind. In Ireland both North and South many of these Priests that you talk of are being named and shamed by past parishioners as having abused them as children. If that isn’t bad enough it has come to light that knowledge of these Priests abuse had been covered up by the Vatican and many of them had just been transferred from one Parish to another rather than embarrass the Church. I believe that one Priest who is dead now had been sent to America. I have also heard of abuse in a Protestant home but it is not to the same scale as the Catholic Church. Again those named were high standing in the Community once more causing people to doubt the morals of those in authority over them. It is causing a falling away from Churches here for many young people do not want to be preached to by men who proclaim to be Godly when using their positions to misguide and abuse. It also means that those who are Godly men are also under suspicion and they have to prove themselves trustworthy! Many preachers are carrying on tradition and not following Biblical teaching. Only this year our own Clergyman stipulated that we his Parishioners were not to celebrate Halloween for it is a pagan practise. This is the first time in our Parish that a Clergyman has enforced such a view before that I was not aware it was pagan practise. In a way the Priest is right that tradition is carried on and it is only a minority of Clergy who will challenge it. I believe it is because they have already small numbers and know that practices like Halloween have been tradition for years and they will not be too popular for changing it. That is exactly what our Clergyman found when he stopped it. Northern Ireland has had two cultures and it seems that one has seeped into the other, muddying the water to what is Biblical and what is not! I am by the way Church Of Ireland which is as I understand it said to be closer to the Roman Catholic church than other Protestant denominations. I have to add though that in my own Church our Clergy have always preached Christ focused sermons and that is why I have never felt the need to look to another denomination. Peter’s bones are buried there at the Basilica in Rome, he was the first in a long line of “Popes”. The issue being people having “authority issues” led me to ask was it not for issues with the Pope and the authorities in Rome, at the headquarters of the official Christian church that led to the separation of and creation of the Protestant churches. Equally within the Protestant church has it not been authority issues that have splintered the Protestant churches into many different groups each with their own beliefs. The end result that people continue to separate into smaller groups to the point of belonging to no group or church at all. Finally finding oneself left to only have God to hold into question concerning our faith. For some reason that really jumped out at me in a convicting way. It gave me pause to meditate on that statement. I filed it under “it’s not about me”. I have an issue with making it about me and this was a good reminder to not do this. Thanks for sharing it. Also, thanks to all of you who have prayed for my 33 year old son to find a job. He still does not have a job but does have second interview with a company today. Please continue praying. Thanks. I believe where your bones are buried has absolutely nothing to do with “who you are,” in Christ, or God. For there are certainly many of those in Christ who’s very bones can not be found. As pooh has said in the past, just because you spend your time in a garage, it does not make you a car. I would add to that, Nor does a Burial at Sea make you a fish. So, to me, the placement of your bones is many times all about the choices of others, who may or may not even know you, and not necessarily about the Hand of God. Am thinking of those who had to dig trenches to bury all the Jews who were killed during the Holocaust as well. What does the location of their bones then signify? Christ is not coming back to embrace the Basilica in Rome, or any bones buried there. He is coming back for “His Church” not the Basilica in Rome, Because His Church is not built upon the any Papal position of a Pope, but, it is built upon those who have been Awakened by the Holy Spirit to having the proper acknowledgement and relationship with Christ, those who know Him personally. That personal relationship does not come from any religion or church, it comes from the Baptizing of the Holy Spirit, which by Faith is deposited into every believer. There is no other way, person, or church, or religion, that can make that process happen, because it is the Gift of God not from any man, according to what I have read in the scriptures, and has been revealed to me through His Holy Spirit. All mankind, being born today with a Sin Nature, also have Authority Issues somewhere in their lives, so, let’s not bang the church for their ever present divisive postures. Good is opposed to Evil just as Darkness is to Light, and Man is to God by his very nature, and, Only God can change that! Then God got it right as prophesied for the end times, Steve, each would go their own way and that is what is happening in the world today, no Church can claim to be God’s authority on earth for all have wandered from the truth. This is all part of God’s plan, fear not, God is in control not religions, He has to destroy that which is ungodly in order to bring about His authority on earth. If you think about it Steve we are all brainwashed into our own religion and culture and God has to break us away from those beliefs in order for Him to establish His truths for none of us have the whole truth but each religion has part truth. If all have only part truths then God becomes the authority which we all have to bough which makes us all equal in God’s eyes leaving no one with authority over another and therefore making us all humble before God. For God has His reasons for dividing us that only Heaven knows, it was necessary for there is good and bad in every religion and every person but there is also the downright ugly as we all have witnessed at some time in our lives. He with the King of Glory will reign eternally. This conversation has surfed several waves of thinking about authority and authority issues. Thanks for putting me to thinking beyond my own personal collection of experiences. 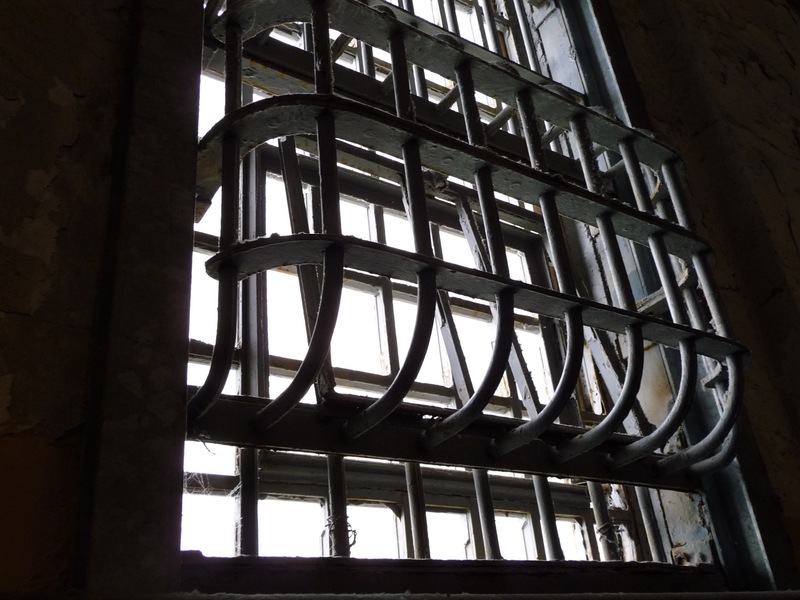 Literal prison – thick walls, barred windows, life controlled by others – it seems to me brings home the reality of a person being so bound up in what (s)he wants that nobody else matters to him/her. 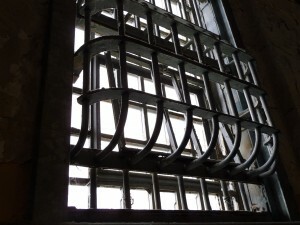 A prison window is the emblem of emotional and spiritual isolation. The truth of God-breathed life is the opposite of this imprisonment. We are connected, not separated, because we are all created by God in God’s image. Jesus shows us the freedom of clinging to our Creator God. What a privilege to follow Him into the vineyard to work for His kingdom! What is the purpose of human life if not to serve God and one another? ref, the Our Daily Bread for today was really relevant to the thought “it is not about me”. I think that is a struggle that all of us are faced with even from the first sin in the garden. Pride! Talking to others as if we are an authority rather than prefacing it with; it seems, or could it be, anything that would lead others to think we know it all. Which is the highest form of self deception, speaking as if we are an authority on any issue and not realizing we are all on this journey of discovery together looking to the Final Authority. Putting oneself on a pedestal only to find the higher you place yourself the further you fall when you are humbled and one day everyone will be humbled. ref, my apologies that was yesterdays Our Daily Bread for Thursday. Ok now you will see how totally weird I am refump. I have ODB in the bathroom and when I opened it this morning it was to next Thursday not yesterday. I hope this is not a picture of how my whole day will be going, lol. So it was May 14th “Listening With Love”. Now that I am so totally confused maybe another cup of coffee will help. :-) The wrong day could have been by design in some way. I have another thought pertaining to ‘authority’. I think that rather than seeing those in authority as ones to attack it would be more fruitful to first pray for them, for their eyes to be opened as Nichodemas and Paul’s eyes were opened. Jesus attacked the Jewish leaders because they were teaching the Law, but not keeping it perfectly. He had to be blunt and brutal to shake them up for they were misleading others about God; not having the whole picture. How could they though, not yet seeing the promised Messiah until He stood right in front of them and finished fulfilling Isaiah and the other prophets’ message. Remember when President Bill Clinton was caught in scandal? I was one of those condemning and shaking my head at his sin. Yet, Jesus opened my eyes when a lone voice I heard in some sort of national convention (religious I think) prayed that God would open his eyes to the truth of who He is, that He is a loving, kind, and forgiving God. When I look back at that time now I shake my head at my audacity to condemn him for his sins, when mine were ONLY cleansed by the blood of the Lamb. I was a Pharisee, shaming and blaming him for not keeping the moral laws of the land. Had I been in a position in government that was appointed to keep the law, I would have done my job well. But I was NOT and became part of the crowd that threw stones, instead of prayers for his salvation. Most of us have been brought up in one faith or another and unless we think or know that we are listening to false teaching we have no reason to question it. I for one had heard so many denominations disagree on the Bible I decided I was not going to confuse myself by reading it. I have always been satisfied that my Church focused on Christ, in that we were saved by His dying on the cross and not of any works of my own and that I should therefore walk humbly with God. I was also told that my human flesh would get in the way of doing this perfectly but to not fear for salvation was SOLELY by God’s standards not man’s and that God was satisfied by Christ’s sacrifice for all man’s sins so I accept another will fall short of perfection as I do myself and not look at their faults but see them as God does saved by Grace as I myself am saved by Grace. It is man who adds to what God said that complicates the Gospel and as I see it all religions are guilty of this so that means God is the only authority that is trustworthy for religions have only part truths. If I believe the victory is Christ’s then it automatically follows that the victory is also mine so no matter what happens now my eternity is in Christ. It is man who puts doubts in peoples minds by not keeping the gospel simple, I was told that a long time ago and I would say that man gave me very good advice. Searching the scriptures for oneself is what brought about the reformation. The church leaders at one time are the very one’s who prevented the Bible from getting into the hands of the common man but when that common man started reading, that is when change happened and there was no more dominance from just one religion who wanted to control people. That is what is happening now as the body now goes into every tribe and tongue to translate it into their languages. So they can have personal knowledge of what God has said to listen to His authority not to go through another person but to find out for themselves personally. Viv I have found that so true, “keep it simple, stupid” works for me! How about “Keep it Simple Saint” KISS? What about Islam it is now trying to dominate and is the largest religion in the world with over 1 billion followers. History tells us that as we get rid of one tyrant there is another ready to take over. As individuals we find peace in Christ and in a world where peace is elusive that is such a comfort. My father fought in the WW2, and my son ended up in the Afghanistan war, and I had family and friends caught up in the religious war here. I can hardly remember a time when someone close to me was not involved in war. I do not want to see man’s peace on earth for it is temporary but long for God’s peace on earth for then and only then can we have a lasting peace. Just to crunch the best numbers available (pew research), at a current world population of about 6.9 billion, 31.5% are Christian today — 23.4% are Muslim. Perhaps, Vivien, you are anticipating a future time (2030?) when it is projected that the number of professing Muslims will surpass the number of professing Christians. I also pray and trust God for the reign of the Prince of Peace, our Lord Jesus Christ. He alone is the answer to all the troubles of terror and war. Jesus is the only answer, the only Savior. Simple works for me too and I am so glad that God does not mind for He can accept me as I am but likewise if one is complex then that is OK with Him too. If only people could be so understanding of each others differences then the world would be a much better place. Keep it simple-stupid is my motto! This world makes things far too complicated. Everything is so complex, everything is over-thought. Everything is overdone. And religion is included in that, in my opinion. Why is everything so over the top? And it seems that people aren’t happy until they are. A simple life is frowned upon and if one possesses child-like faith, they risk being looked at as an immature Christian. been thinking how authority issues come up all the time when the Authority of God in a person life is absent. also people tend to drift towards self-center and/or idolatry. the world is amazing in paradoxes and tensions. i think it leads to choices and faith, of which it is impossible to live sanely without. I think it is authority issues that leaves the world in the mess it is in. I suppose I see it like that having lived in a Country were one side trying to control the other caused much blood to be shed in what each side seen as their right to freedom. In hindsight I can now see how wrong both sides are but when I was coming through the trial I seen it very differently. It was God who revealed to me the error of my ways and no one else could have made me see it like that for my father had tried. If I approach God or read the Bible with pre-conceived beliefs then I get what I want out of it. That then becomes my truth but not necessarily God’s truth. Most people I know who studied the Bible did so having been already indoctrinated with certain beliefs and they were taking from the Bible the passages which reaffirmed these beliefs. Both religions therefore belief God is on their side. When you hold a belief that God is on your side then you belief you have the right to do what you do for you are doing the will of God. I learned the hard way how the mind can be much more difficult than the heart to change. When I believe in my heart that I have God’s authority then it does not enter my mind how wrong I have got it. The English as most people know were hated by the IRA and suffered and many young British soldier lost his life on Irish soil and that was at the root of our war. An English soldier said to me we had many Chapels and Churches in Ireland but very few Christians, I can assure you at that time I was not proud to be Irish or even call myself a Christian and as I knew he was hurting deeply from loosing comrades I decided not to try to defend those who were not in agreement with the IRA for he would have seen it that I was trying to excuse what was happening here. Everyone talks of love these days but they forget that hate is a very powerful emotion and combined with people feeling justified because of past injustices and add to that that they are doing it in the hope of freedom from those who as they see it are persecuting them and you have people that are hell bent on destruction and no power on earth has ever been able to stop those determined to take the law into their own hands. My son has always told me you live by the gun you die by the gun, he himself joined the British Army believing he was on the right side but I am glad to say he left it last year for I am old enough and wise enough to know now that there never is a right side when it comes to war. When one allows evil to have authority in a heart and mind then bitterness, rage, hatred, malice has won. Forgiveness, grace and mercy can replace it but where our focus is that will be where our heart follows. There is much good in this world but sadly it does not make the news like the evil does. There is a battle that rages within each of us and each can make the choice which to focus on or which will have authority over us. Paul wrote that under Roman dominance, oppression and suppression. What would have happened if Hitler was not stopped or all those who committed genocide? There is a time for war and taking a stand against evil and to die while protecting innocence. When evil is let to have free reign without the strong protecting what is good, then our society would look a lot different than it does now. We have a big gang mentality in this world that takes the lives of women, children and the weak should we just stand by and allow it to happen while doing nothing? That to me is saying that evil will win while good men stand by and watch it, doing nothing is in fact saying it is OK and it is not OK.
Viv you have had an interesting life and wow how God has taught you through those life experiences! Proof that no matter the ‘authority’ in this life God prevails! I enjoy hearing about your journey and what a witness to the faith you are! Thank you for being obedient to listen and to hear Gods voice. Pat yes grandchildren keep us young but they also are a reminder I’m not so young as fatigue sets in sooner than I’d like! Lol! Keeping it simple though does bring more joy in life knowing Gods really in control and alls’ well that ends well, our ending being in Gods very capable hands. It is well with my soul, as long as I ignore complicating factions, authorities who’s desire is for evil and not good. Easier to do sometimes than others. Blessings and joy to all! Just wanted to thank everyone for praying for my son to get a job. He just called me and said that he has a new job starting Monday.thank you all and praise God! been thinking how flesh can not submit to the will of God in any way shape or form. Jesus said the spirit is willing but the flesh is weak. He sent a New Spirit and asks us to take up our cross daily. i have to admit taking up the cross each day is not fun, but not taking it up doesn’t get me to where i want to be. paul talked about a joy set before Christ endured the cross. this joy is something to look for. Refump so happy to hear of this answer to prayer! Been praying fervently for him. Pooh, There is a time for war but the world wars were very different to the war here in Northern Ireland and other wars that have been since the world wars. There has been a real unease among the British people about why we are getting involved in wars that have benefited no one. I can assure you that Northern Ireland is not a better place for having had a 30 year old war in which 3.000 people lost their lives and there is still only an uneasy peace with people in Government who were members of the Irish Republican Army and make no bones about the fact that they still hate the British and want them out of Northern Ireland. As I have said before until God’s peace is established on earth men will not solve the problems of war they never have and I don’t believe they ever will. We can no more trust the Governments motives than we can the oppressors and that is what has come to light, the Iraq war was a prime example. Men in Government are capable of wrong motives for going to war and it is our young men who are out there putting their lives on the line when these wars could have been avoided if Governments had done the right thing in the first place. We have to stand up to wrong doing where ever it comes from and lately there has been many revelations about Governments motives for getting involved in wars and they are not exactly pure. Surely Jesus did speak against rulers and authorities whom he knew were wrong doing! jeff1, all that you say is a very small glimpse into the workings of governments. Human beings are the ones who wanted to be ruled my governments initially God wanted to be the One to lead His people but mankind wanted to be ruled by mankind and that is what we got. Imperfect people with selfish motives now are in government but they are also in every mirror we look into that is why we can be so grateful for grace by the Authority of the One who knew our hearts. For those places that have democracy the people are the ones who chose those peoples to represent them. Running the governments is a very very grave responsibility, just like being a parent is a very big responsibility and I know for myself as I look back I see many areas that I failed in. Now multiply that by millions and that is why we need to hold those over us up in prayer. We mostly only hear from a slanted media what goes on behind the scenes but there is much happening that we have no clue about. Obeying the government as Paul was speaking about I believe means for us to follow the rules even if others do not do it, as followers of Christ we are encouraged to. Just like you said that does not mean to go against the Highest Authority and his rules to obey the government when in the wrong. That goes without saying I hope. I go 4 miles over the speed limit I know that is a puny thing but it is breaking the law. I learned that words people say to each other are equated with murder as far as the Highest Authority is concerned i.e. calling names, putting people down, snide remarks, attacking a person’s character etc. but people even knowing that they are doing it still go ahead and do it intentionally. Think of how much damage and hurt that alone does to a person. God gave us authority to do good and do we do it in just the little world that surrounds us? You do not have to convince me but that is why I believe until God brings his whole authority on earth man will keep repeating the same mistakes for it is human nature we hand down our own prejudices and wrong held beliefs to the next generation so it requires God’s intervention to stop it. the long arm of the law, is an arm of love! sure the law condemns us all, but if your religion can not save the condemned? religion if i am right is to bring us to a right relationship to God not the other way around. relationships and freedom are a good mix for fireworks too!